In I896 a sixteen-year-old schoolboy walked out on his family and, driven by an inner compulsion, slowly made his way to Arunachala, a holy mountain and pilgrimage centre in South India. On his arrival he threw away all his money and possessions and abandoned himself to a newly-discovered awareness that his real nature was formless, immanent consciousness. His absorption in this awareness was so intense that he was completely oblivious of his body and the world; insects chewed away portions of his legs, his body wasted away because he was rarely conscious enough to eat and his hair and fingernails grew to unmanageable lengths. After two or three years in this state he began a slow return to physical normality, a process that was not finally completed for several years. His awareness of himself as consciousness was unaffected by this physical transition and it remained continuous and undimmed for the rest of his life. In Hindu parlance he had `realized the Self’; that is to say, he had realized by direct experience that nothing existed apart from an indivisible and universal consciousness which was experienced in its unmanifest form as beingness or awareness and in its manifest form as the appearance of the universe. Normally this awareness is only generated after a long and arduous period of spiritual practice but in this case it happened spontaneously, without prior effort or desire. 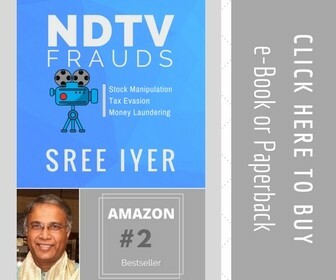 Venkataraman, the sixteen-year-old schoolboy, was alone in an upstairs room of his uncle’s house in Madurai (near the southern tip of India) when he was suddenly gripped by an intense fear of death. In the following few minutes he went through a simulated death experience during which he became consciously aware for the first time that his real nature was imperishable and that it was unrelated to the body, the mind or the personality. Many people have reported similar unexpected experiences but they are almost invariably temporary. In Venkataraman’s case the experience was permanent and irreversible. From that time on his consciousness of being an individual person ceased to exist and it never functioned in him again. Venkataraman told no one about his experience and for six weeks he kept up the appearance of being an ordinary schoolboy. However, he found it an increasingly difficult posture to maintain and at the end of this six week period he abandoned his family and went directly to the holy mountain of Arunachala. The choice of Arunachala was far from random. Throughout his brief life he had always associated the name of Arunachala with God and it was a major revelation to him when he discovered that it was not some heavenly realm but a tangible earthly entity. The mountain itself had long been regarded by Hindus as a manifestation of Siva, a Hindu God, and in later years Venkataraman often said that it was the spiritual power of Arunachala which had brought about his Self-realization. His love for the mountain was so great that from the day he arrived in I896 until his death in I950 he could never be persuaded to go more than two miles away from its base. After a few years of living on its slopes his inner awareness began to manifest as an outer spiritual radiance. This radiance attracted a small circle of followers and, although he remained silent for most of the time, he embarked upon a teaching career. 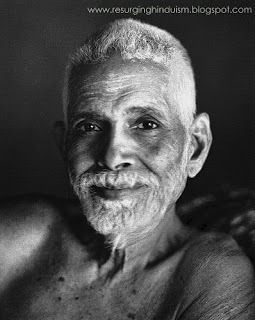 One of his earliest followers, impressed by the evident saintliness and wisdom of the young man, decided to rename him Bhagavan Sri Ramana Maharshi – Bhagavan means Lord or God, Sri is an Indian honorific title, Ramana is a contraction of Venkataraman and Maharshi means `great seer’ in Sanskrit. The name found favor with his other followers and it soon became the title by which he became known to the world. At this stage of his life Sri Ramana was speaking very little and so his teachings were transmitted in an unusual fashion. Instead of giving out verbal instructions he constantly emanated a silent force or power which stilled the minds of those who were attuned to it and occasionally even gave them a direct experience of the state that he himself was perpetually immersed in. In later years he became more willing to give out verbal teachings, but even then, the silent teachings were always available to those who were able to make good use of them. Throughout his life Sri Ramana insisted that this silent flow of power represented his teachings in their most direct and concentrated form. The importance he attached to this is indicated by his frequent statements to the effect that his verbal teachings were only given out to those who were unable to understand his silence. As the years passed he became more and more famous. A community grew up around him, thousands of visitors flocked to see him and for the last twenty years of his life he was widely regarded as India’s most popular and revered holy man. Some of these thousands were attracted by the peace they felt in his presence, others by the authoritative way in which he guided spiritual seekers and interpreted religious teachings, and some merely came to tell him their problems. Whatever their reasons for coming almost everyone who came into contact with him was impressed by his simplicity and his humbleness. He made himself available to visitors twenty-four hours a day by living and sleeping in a communal hall which was always accessible to everyone, and his only private possessions were a loin-cloth, a water-pot and a walking-stick. Although he was worshipped by thousands as a living God, he refused to allow anyone to treat him as a special person and he always refused to accept anything which could not be shared equally by everyone in his ashram. He shared in the communal work and for many years he rose at 3 a.m. in order to prepare food for the residents of the ashram. His sense of equality was legendary. When visitors came to see him – it made no difference whether they were VIPs, peasants or animals – they would all be treated with equal respect and consideration. His egalitarian concern even extended to the local trees; he discouraged his followers from picking flowers or leaves off them and he tried to ensure that whenever fruit was taken from the ashram trees it was always done in such a way that the tree only suffered a minimum amount of pain. Throughout this period (I925-50) the centre of ashram life was the small hall where Sri Ramana lived, slept and held court. He spent most of his day sitting in one corner radiating his silent power and simultaneously fielding questions from the constant flow of visitors who descended on him from every corner of the globe. He rarely committed his ideas to paper and so the verbal replies given out during this period (by far the most well documented of his life) represent the largest surviving source of his teachings. convincing his followers that this was their true and natural state. Few of his followers were capable of assimilating this truth in its highest and most undiluted form and so he often adapted his teachings to conform to the limited understanding of the people who came to him for advice. Because of this tendency it is possible to distinguish many different levels of his teachings. At the highest level that could be expressed in words he would say that consciousness alone exists. If this was received with skepticism he would say that awareness of this truth is obscured by the self-limiting ideas of the mind and that if these ideas were abandoned then the reality of consciousness would be revealed. Most of his followers found this high-level approach a little too theoretical – they were so immersed in the self-limiting ideas that Sri Ramana was encouraging them to drop that they felt that the truth about consciousness would only be revealed to them if they underwent a long period of spiritual practice. To satisfy such people Sri Ramana prescribed an innovative method of self-attention which he called self-enquiry. He recommended this technique so often and so vigorously that it was regarded by many people as the most distinctive motif in his teachings. Even then, many people were not satisfied and they would continue to ask for advice about other methods or try to engage him in theoretical philosophical discussions. With such people Sri Ramana would temporarily abandon his absolute standpoint and give appropriate advice on whatever level it was asked. If he appeared on these occasions to accept and endorse many of the misconceptions which his visitors had about themselves it was only to draw their attention to some aspect of his teachings that he felt would help them to better understand his real views. Inevitably, this policy of modifying his teachings to meet the needs of different people led to many contradictions. He might, for example, tell one person that the individual self is non-existent and then turn to another person and give a detailed description of how the individual self functions, accumulates karma and reincarnates. 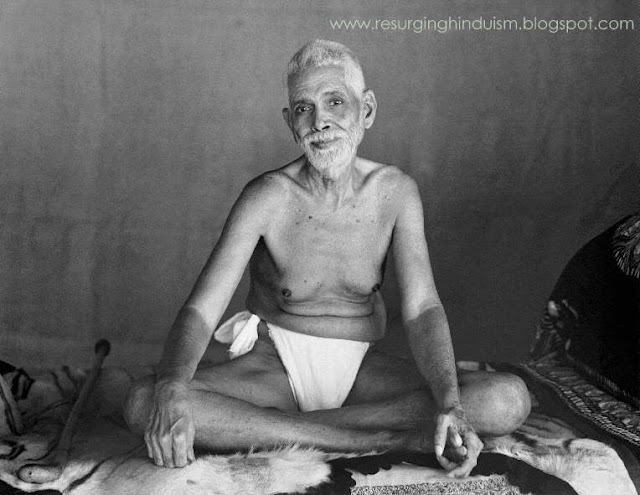 It is possible for an observer to say that such opposing statements may both be true when seen from different standpoints, but the former statement clearly has more validity when it is viewed from the absolute standpoint of Sri Ramana’s own experience. This standpoint, summarized by his statement that consciousness alone exists, is ultimately the only yardstick by which one can realistically assess the relative truth of his widely differing and contradictory statements. To whatever extent his other statements deviate from this it may be assumed that to that extent they are dilutions of the truth.